The battleground – It was March, 1992. The crowd cheered and cameras flashed in a shady wrestling place named Dallas Sportatorium. The backdrop – Stevens Aviation, an aviation sales and maintenance company in South Carolina had been using the slogan ‘Plane Smart’ for a year before Southwest Airlines, a major US airline company in Dallas, started using ‘Just Plane Smart’ for its ad campaigns. 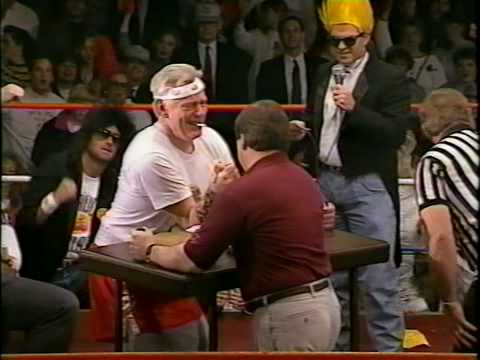 Stevens brought this to Southwest’s notice and proposed a one-on-one arm wrestling with top fighters from both companies in front of all their employees and media, instead of spending huge dollars on lawsuits to settle the dispute. The best contender in two out of three matches would win the rights of the slogan and the loser of each match would donate $5,000 to the charity of the winner’s choice. The challengers – The CEOs of both companies – Herb Kelleher, from Southwest and Kurt Herwald from Stevens came face to face, err, arm to arm. Kelleher created a promotional video showing the training for the match, which was distributed among his employees and as a press release, before the actual match. Finally the D-day arrived. ‘Smokin’ Herb Kelleher and ‘Kurtsey’ or ‘Killer’ Kurt Herwald stood inside the ring, crowed hooted, pom-poms flashed and the fight began. It had got every element of a wrestling match – sweats, rising level of craziness, drama and accusations. In the end, Kurt Herwald won the rounds and immediately granted Southwest Airlines to use the slogan ‘Just Plane Smart’. The outcome – Both companies used their slogans, a $15,000 donation was made to charity and a legendary publicity for both parties. The match was covered by major media houses and received a congratulatory letter from the then US president George H.W Bush. Southwest reportedly earned $6 million in publicity benefits and Stevens enjoyed 25 percent annual growth.